Home » Family » Fitbloggin » Inspiration » The Point. I remember my first Fitbloggin as if it was yesterday. I also remember how much I cried from start (meeting Carver as I got out of the cab) to finish (having to say goodbye to everyone). 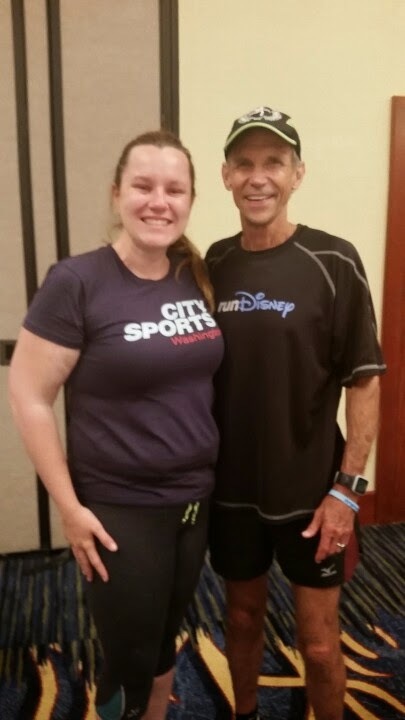 I managed to survive Fitbloggin 2014 without shedding too many tears, that is until I met 1972 Olympian Jeff Galloway. Now keep in mind, as someone that doesn't really run, I had no idea who Jeff was until about 5 minutes before he walked in the room. But after a quick Wikipedia search, I realized he was just the man I needed to talk to. He came to Fitbloggin as a part of the Run Disney sponsorship of the conference. Before our 1 mi walk/5k/10k, he talked about how we, as bloggers, are able to change lives and inspire greatness in others. He talked about how exercise adds life and vitality to our years. He talked about how fitness is a family value. I walked the first half of the 5k ((**waves to walking group! **)) and then somewhere around the midpoint, after being in my head for a while, something in my mind decided that despite the pain I was in (urgh my back! ), that I couldn't miss the opportunity to speak with Jeff Galloway (who ran the 10k, I think). I began to jog for the first time since February. First of all -- he's the NICEST person, EVER. He took the time to chat with everyone who wanted his time. Not only that, he was interested in what they were doing in their lives, in their families, in their communities. Yet, despite being the nicest person, he's the only person to make me flat-out cry at Fitbloggin 2014. How? I told him how what he said about being able to change lives really struck me, but that it's all for nothing if we can't help to inspire and change the lives of the people we love the most. Then he asked me who I loved the most. And I started bawling. Through the tears I asked if he would speak to the person that I love the most -- the person that I want to live a long and healthy life, the person that I worry the most about: my dad. Dad: I'm not trying to embarrass you, or call you out. I just want you to try. I just want you to live a long and healthy life. I want you to want that as well. And I hope you know that you have my full support. And if I know my readers the way I think I do, I think you'll find they will support you too. Dad, give me a reason to show you that I'm your biggest fan and cheerleader. This video confirms that Jeff Galloway is one of the nicest people. I would enjoy meeting him to. I like the special message. He can do it with the love and support from such a wondeful community and daughter. The key to success is having people who believe in you. Oh my goodness...TEARS. You both inspire me. I love his method and his message. YOU CAN DO IT. Why is it that Dads will do a lot for their families, but won't take care of themselves? My dad wouldn't let us do bday parties or celebrations for him. Too humble, that one. but we love him and want him to be healthy. He started watching his salt intake, FINALLY, after the doctor got on him for years. @Bec -- Carl Jung once said "The greatest burden a child must bear is the unlived life of the parent." And I think that means the hopes/dreams, but I think it is also sometimes the regret. I think the greatest thing a parent can do for a child is live a kickass life -- full of love, adventure, curiosity, and health. We model those things after our parents. I'm glad your dad is finally watching his salt intake. This message is EVERYTHING. I loved reading this (and re-reading this). So poignant and real. I wish I would have met Jeff Galloway. He is a testament of feeling alive, running for health...as he said "you can do it!" Sending you and your dad lots of love and light on your journeys! :-) Love you. Hope Dad understands the spirit behind this message. I met Jeff Galloway at the Tinkerbell Half Marathon and HE gave me an inspirational message for my hubby. He is so darned generous and kind. Yay for him and for Dad. I understand -- more than I want to post about here -- but sometimes you just have to accept and love someone as he is and not as you'd like him to be. Maybe he will come around and maybe he won't. Loved meeting you at Fitbloggin'. You're even more beautiful in real life. @Toledo Lefty -- I know it's a matter of grace to accept someone as they are -- but after having lost my mother 20 years ago, I'm not willing to lose another parent to obesity and the co-morbidity factors. I love my dad as he is, I hate the way he treats himself and his body. I never like running.....ever....was forced to do it by my father to "exercise the dog"...anyway, running has not been part of my exercise regime. Until i decided that i wanted to do a biggest loser off road challenge. Running and training would be a requirement...my sister found the Easy 5k with Jeff Galloway app. This app has changed my entire outlook on running. I hadn't exercised in many, many years.....Jeff has created a desire to run & workout.....and mostly, Jeff has made me look at myself differently. @Cassiopeia -- He's such a sweet and awesome guy. I am glad that i got a chance to meet him and learn his story. I think that running isn't about what it does to your body physically -- it's about how your brain interacts with your body -- do you get over your fears and preoccupations about waht running is/isn't supposed to be? Hello! I've really enjoyed reading your blog. I'm on a quest to lose 160 pounds, and being able to read everyone's recaps of FitBloggin '14 has been SO inspiring! Thank you for sharing!